It's been great because I was feeling really down since I felt my inspiration was totally gone. I felt drained and without any will to create new things, so I did what I do best when I feel down. SHOPPING! I raided the watercolor section of several shops and when a big box full of paints arrived at my door I immediately ripped off the paper and sat down to experiment. It Worked!!! My creative me is back with lots of energy, I've been painting at any free moment I have. Here's the result, and I LOVE it, and I know you will too. 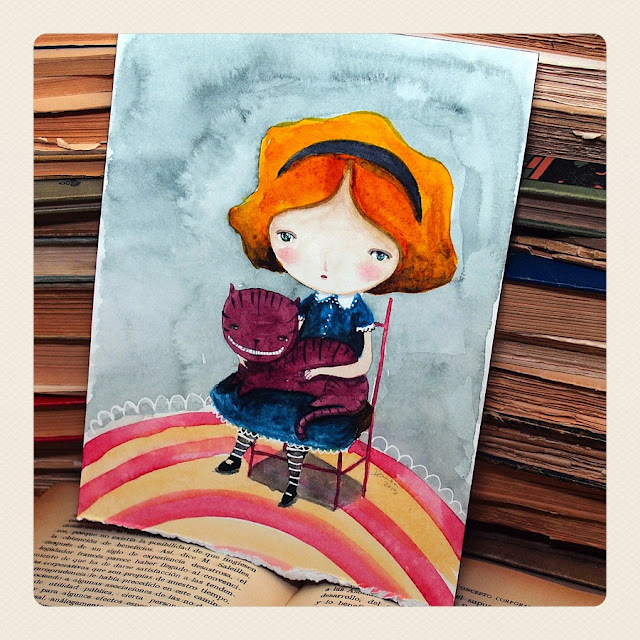 All the Alice watercolors you see are available now on my Etsy Shop, just click on the image and it will take you to the link to purchase it. Don't believe me about getting crazy every spring with Alice? 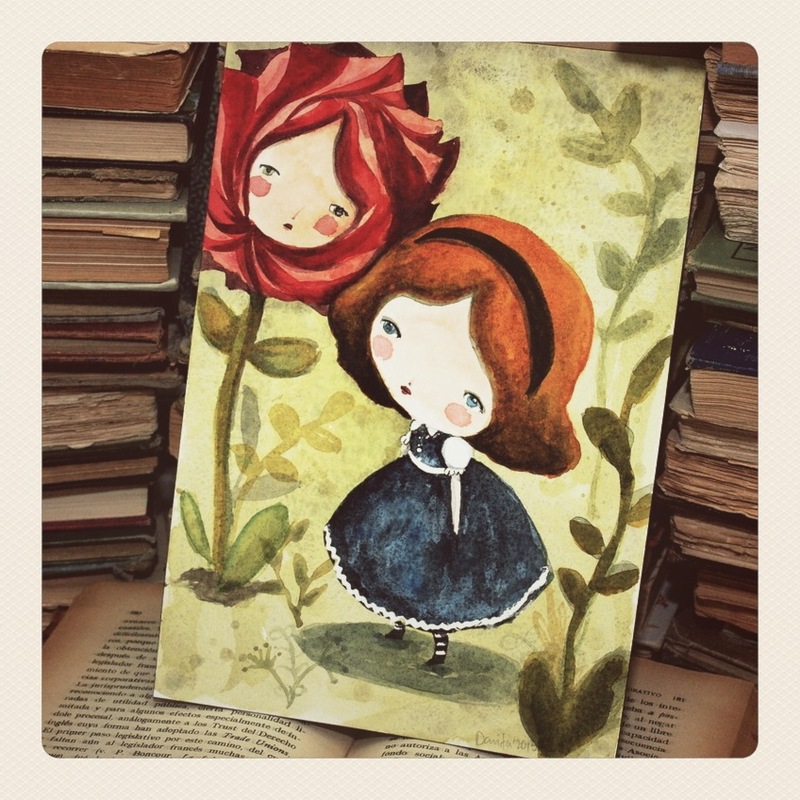 Check out my previous Alice work on my shop... Lots of them, released every spring and now back from the vault as beautiful paper prints and ACEO blocks. Me siento muy bien, ya me habia deprimido al sentir que hace unos dias la inspiracion no me llegaba, asi que hice lo que hago mejor cuando me siento deprimida... Ir de compras! Asalte las seciones de acuarelas de varias tiendas y cuando una gran caja de pinturas llego hasta mi puerta me sente a experimentar con mis pinturas nuevas. Y Funciono!!! Estoy de vuelta con mucha creatividad y me la paso pintando en cada momento libre que tengo. Y me encanta el resultado, y yo se que a ustedes tambien. 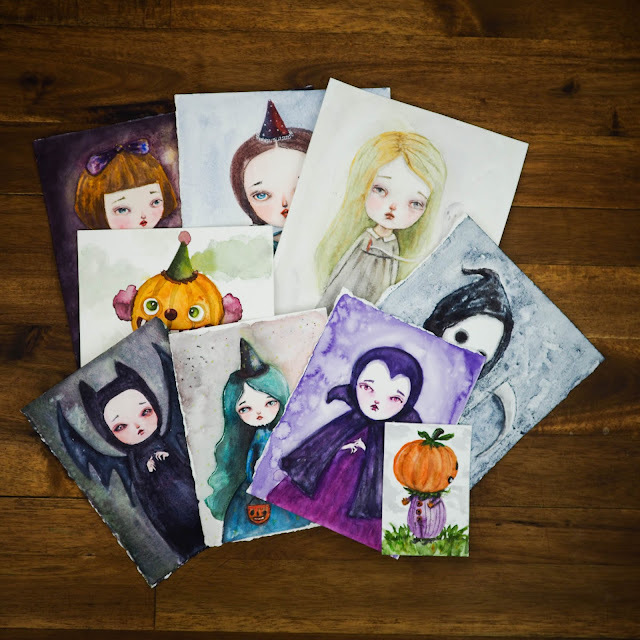 Todas las acuarelas que ven estan disponibles en mi tienda en Etsy, solo hay que hacer click sobre una imagen para poder comprar el original. Y si no me creen que cada temporada me doy vuelo con Alicia, vean mis trabajos previos en mi tienda. sin falta, cada primaver hay trabao nuevo que ahora esta disponible en reproducciones coleccionables. Absolutely adorable! 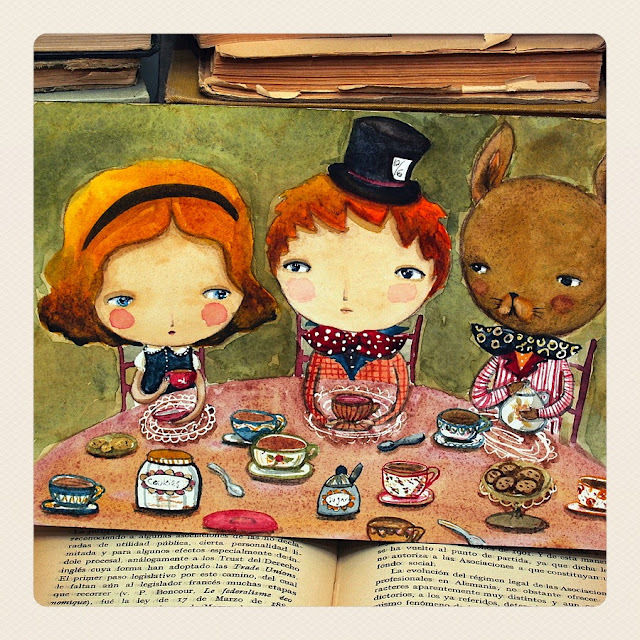 Love the tea party scene! Oh, Danita! 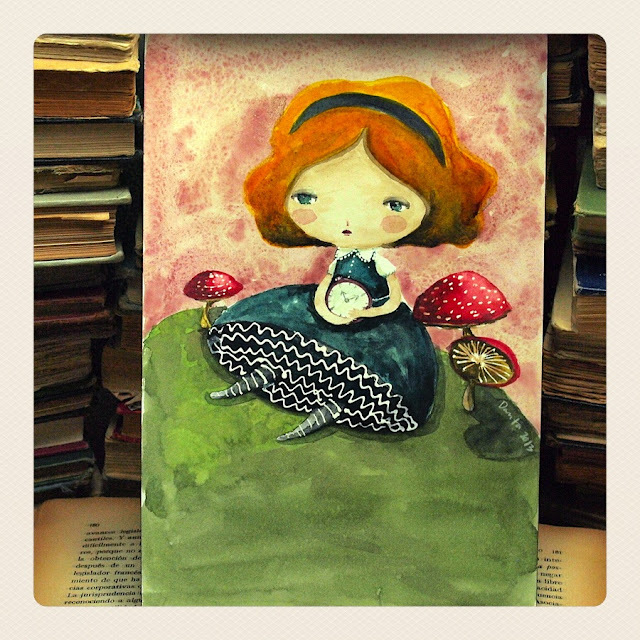 I love your watercolor Alice In Wonderland work! Sometimes the muse has to take a break, too. Glad you are back in the swing of things, and using watercolors, too! Wonderful! wow!!!! gorgeous times 10!!!! lovely work danita! I'm very glad that you have found your inspiration again :)) Thes Alicia works are very nice! Cuánto me alegro de que la inspiración haya dejado de hacerse la remolona y esté otra vez junto a ti. 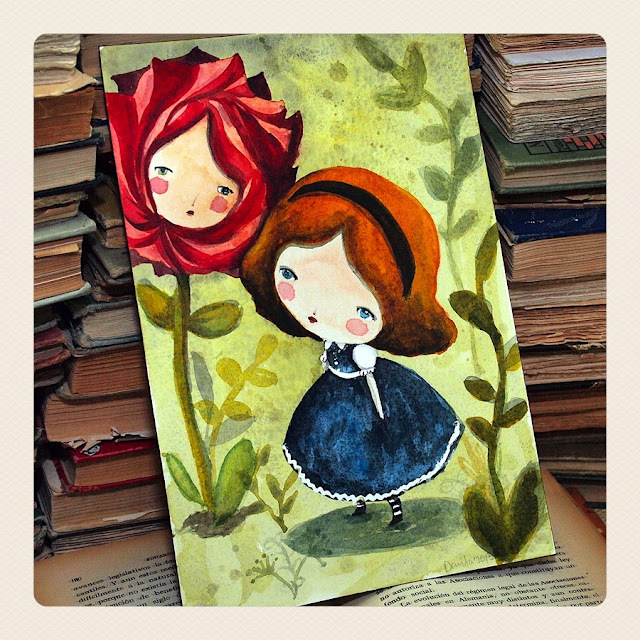 Estas acuarelas son tan bonitas! Son diferentes, pero tan bellas como todas tus creaciones. Para mí las acuarelas tienen algo especial. Recuerdo que llevaba muchos años sin pintar y vi la película de MISS POTTER y algo se me removió por dentro. Compré una hermosa caja de madera llena de acuarelas con pastillitas y volví a recuperar algo que siempre me había hecho muy feliz. Además son maravillosas para los niños. Cuántas tardes preciosas con mi hija y alguna amiga pintando con las acuarelas!! Besitos y gracias siempre por tanta belleza que nos regalas! Oh my goodness! You make magic with whatever you get your hands on!